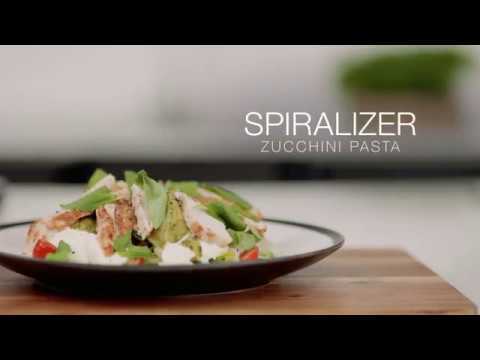 With its durable powerful blades, the spiralizer can cut through soft and even the harder vegetables. So you can spiral apples to zucchinis, even beetroots without any hassles. Sneak extra vegetables into your diet. There are plenty of fun options you can try, spiral cucumber into long curly slices or spiral carrots into your tacos. Try all the George Forman recipes included. The spiralizer is electric, so when you have a large family to cook for you wont get tired wrists from manually turning a handle to create your veggie noodles. It's very easy to clean, simply put the blades, container, feed chute and pusher in the dishwasher after use. Excellent at making spirals of differing sizes. Much much easier than the manual spiralizer I had bought for $30. Such a relief to find one that works so well. This will help keep one healthy. And quicker to cook vegetables as spirals which saves time and money with energy usage. I grow zucchinis so this will be a very useful item in the kitchen. Only bad point was that the manufacturer could have made it clearer which blade was which. Having a letter or word as well as a diagram would help identify. As some diagrams are so similar. One needs to get the booklet out to double-check all the time. So far so good very easy the kids do their apples and carrots. Great zoodles and spoodles, fancy pants veg in soups!